RepRap Universe is a well-known 3D printer producer from Holand. Kai Parthy is the maker of unusual filaments from Germany. Both producers have long experience working in the 3D printing world. The result of their fruitful cooperative work is the 1730 Full Metal Hotend. Kai Parthy is known to have revolutionized the 3D printing community with his unconventional stone and wood filaments. This time he joined ReprapUniverse in order to develop a new hotend that would be able to handle a wide range of special materials. As a result, the new metal hotend can manage 3mm and 1.75 mm filaments just quickly changing the nozzle. Using the 1730 Full Metal Hotend is really easy and efficient. Everyone who has an open-source 3D printer should definitely try it. Indeed, having this Hotend makes it unnecessary to choose the standard of filament, as there are some rare types or colours of filament in one size only. Reprap Universe welcomes each visitor on their Kickstarter campaign page. They promise that their innovative design is leak-proof and is perfect for printing with all the kinds of filaments (standard, special and high-temperature). However, apart from the ability to switch from 3mm to 1.75 mm in a few minutes and leakage proof, there are other innovative features. One of them is improved flow rate of filament and decreased feeding friction (the latter is a kind of difficulty common for PLA and other exotic filament when used with other kinds of metal hotends). Some users may suppose that printing in 3 or 1.75 mm filaments with the same hotend makes no difference, but in fact it’s not so. There are some kinds of materials that cannot be printed in 1.75 mm because of their qualities. But 1730 Full Metal Hotend solves all the problems, so there is no need for you to buy another 3D printer. Mind you that 3 mm filament makes about 35% of the market in Europe. 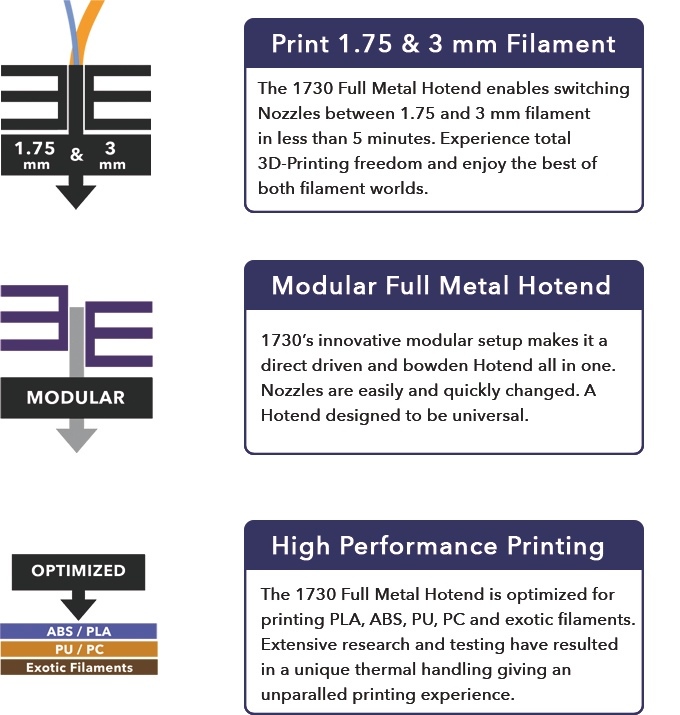 The new Hotend is compatible with a number of Delta 3D printers. Adapters for other 3D printers will become available soon. 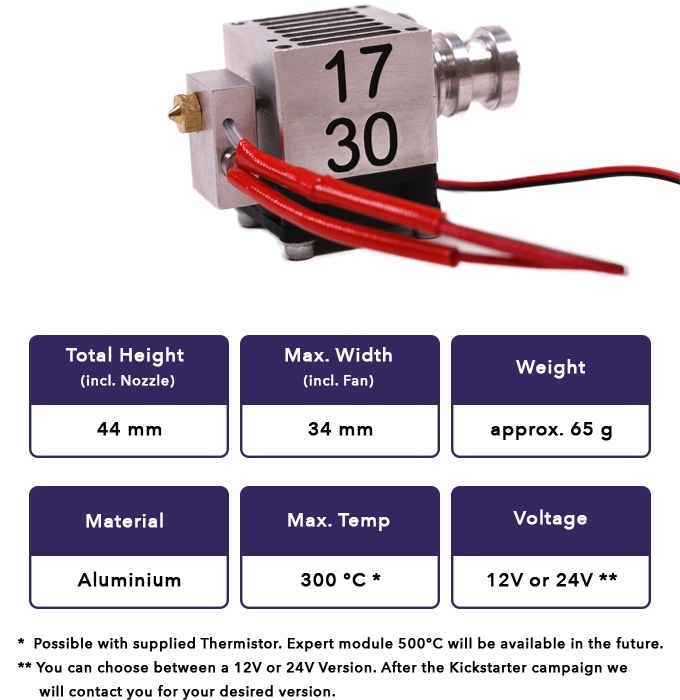 The Kickstarter price for the hotend is estimated at €129 (for, as they say, super-early birds). The package will include Full Metal Hotend, two mounts and two nozzles. In comparison with other similar tools, two assembled E3D v6 Hotends will cost you above 190 euros. If you decide to order at the beginning of the campaign, you will get it by April 2016. The company would appreciate any help from you. The backers will be awarded in a number of ways. 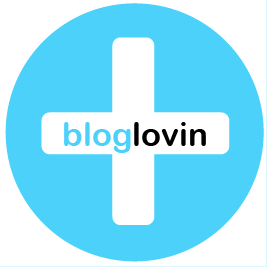 Every tweet, re-tweet, share or like counts.